Smithfield Foods, Inc. and Feed More, a hunger-relief organization serving 34 cities and counties in Central Virginia, unveiled a new refrigerated tractor-trailer to support the organization’s efforts to improve product distribution to the eight localities in the southern region of their service area, where almost 25,000 individuals are food insecure. The tractor-trailer was funded through a $180,000 gift from the Smithfield Foundation, the philanthropic arm of Smithfield Foods. Since 2011, Smithfield has donated more than 300,000 pounds of protein through its partnership with Feed More. The Smithfield Foundation grant supports Feed More’s Gather. Give. Grow campaign to support large-scale investments in facility improvements, refrigeration, and vehicles. Feed More collects, prepares and distributes more than 20 million meals annually to neighbors in need throughout Central Virginia. With a service area that stretches across 34 cities and counties, Feed More’s comprehensive programs and network of nearly 300 agencies helps ensure our communities have access to healthy meals year round. Feed More is a proud member of Feeding America and Meals on Wheels America. For additional information, please visit FeedMore.org, find us on Facebook and follow us on Instagram and Twitter. 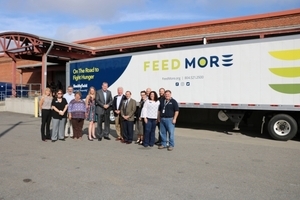 Image Caption: Smithfield Foods and Feed More unveiled a new refrigerated tractor-trailer to support Feed More's efforts to improve food distribution to the eight-county southwest region of Virginia. The new tractor-trailer, which was funded through a $180,000 gift from Smithfield, will deliver between 20,000 to 30,000 pounds of food each day from Feed More’s Richmond facility to their new Southwest hub in Farmville, Virginia.